While working on a novel, I generally like to read things that are pretty different from it. So I’ve decided to go back and catch up on some of the most-hyped SF/F books of the last decade. In general…I have not been that pleased with them. But I won’t mention the ones that I don’t like (since I’ll probably meet their authors someday). 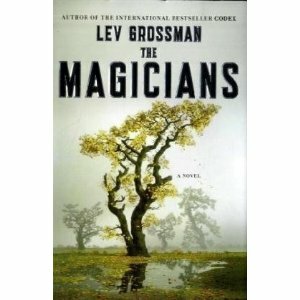 Instead, I’ll mention one that I loved: The Magicians is amazing. It’s basically a mash-up of Harry Potter and Narnia and Donna Tartt’s Secret History. Both of those books are, in their own ways, portal fantasies. They’re about ordinary people who get transported to magical worlds. In this book, our hero, Quentin has spent his youth daydreaming about going to a magical land called Fillory that he read about in a series of popular children’s books (these books map very closely to the Narnia series. Except that Aslan is a pair of goats). And then, surprise, he is admitted to a magical college in upstate New York. But it’s not at all like he imagined! Magic is very hard work. And once you’ve done the work, you still have to face the existential void: Now that you can literally do anything, what do you want to do? I liked it a lot. The dreamy ennui of the first two thirds of the movie was very much to my taste. It’s basically a slow unrolling of his time at college: making friends, overcoming challenges, becoming a better magician, falling in love (sort of). And then the last third is something else. It’s a big of a jury-rigged contraption of a novel, but it makes for a very enjoyable reading experience. And it has, like, THEMES and stuff like that. Stuff about what it means to wish for escape. You, know, gotta love you some of them themes. What science fiction and fantasy novels should I read?